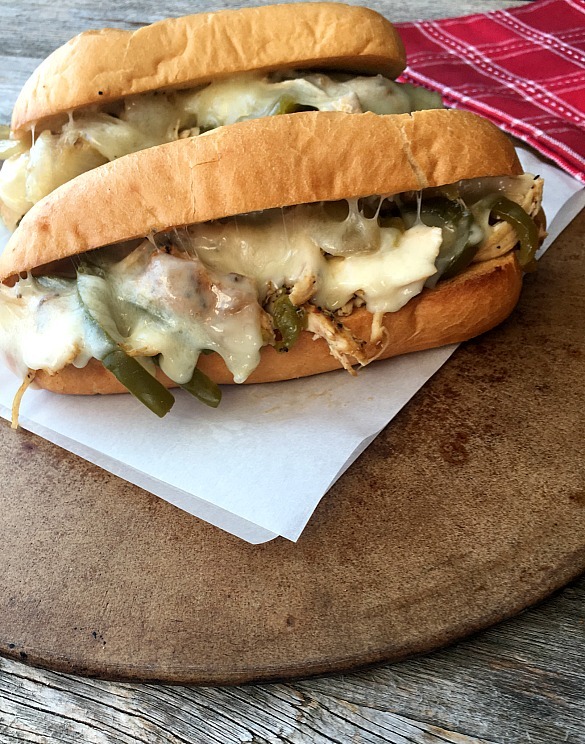 Chicken Philadelphia Cheese Steaks are the perfect recipe for your slow cooker and these turned out delicious and satisfying. The chicken turns out tender and juicy IF you use a meat thermometer to test the chicken for correct doneness. 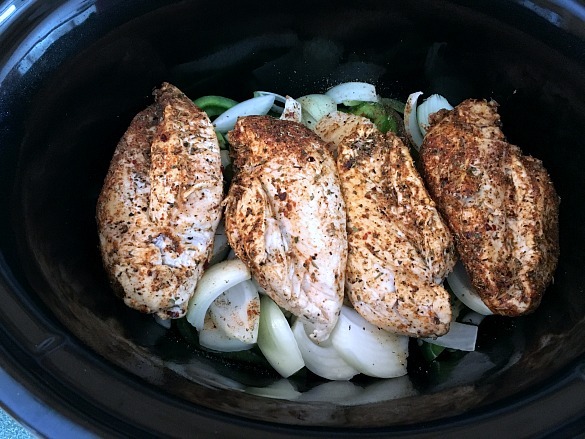 Slow cookers are notorious for drying out chicken and making it flavorless and stringy so I never make a slow cooker chicken dish with it (except for soup-type recipes). Spices tossed over the chicken before cooking only adds to the flavor; this idea I got from my friend Mel over at Mel’s Kitchen Cafe. The combination of smoked paprika, coriander, garlic and thyme are exceptional. I added a little steak sauce to help mimic the meaty flavor in regular Philly Cheese Steaks. 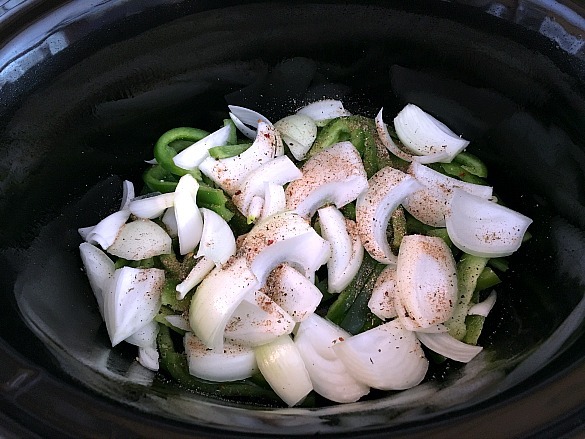 The slow cooker makes the green bell peppers and onion slices just soft enough but still flavorful. Once the chicken is done to 160F degrees (notice that subtle hint about the perfect temp for chicken doneness again? ), it gets shredded and incorporated back in with the peppers and onions. This can stay on warm or low until you’re ready to serve. 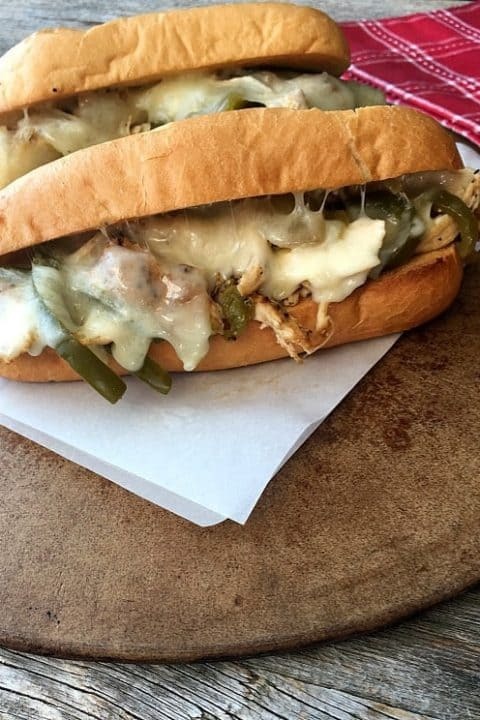 Provolone cheese is a must for Philly cheese steaks. Nice fresh hoagies round out the sandwich. The provolone gets melted until bubbly and then top with your favorite dressing; mayo and mustard, 1000 Island, relish- whatever you like. 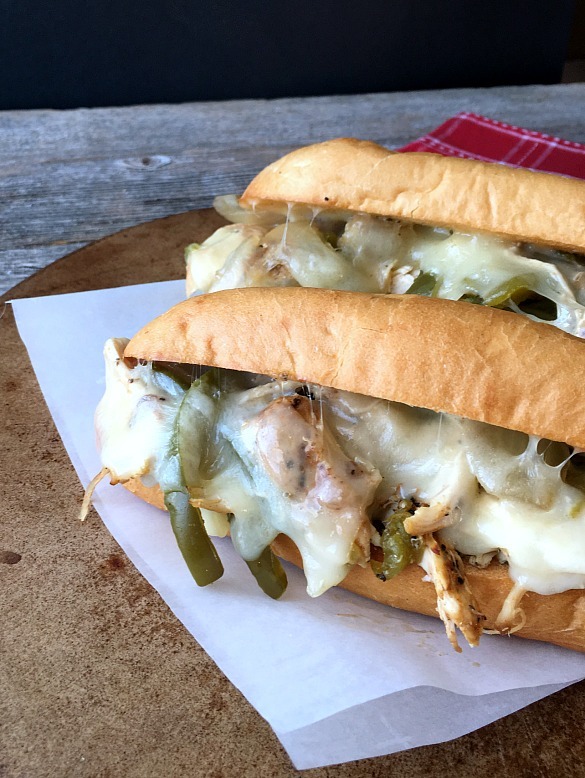 Chicken Philadelphia Cheese Steaks are a great, light alternative to beef Philly steak sandwiches. Serve with Yam Potato Salad or classic coleslaw. Have an instant-read thermometer handy to check the chicken for doneness. This recipe is dependant on your chicken not over-cooking so check the temperature after 3 hours. In a small bowl, combine ingredients listed above through the dried thyme and set aside. Add the sliced green peppers and onions to the bottom of the slow cooker. Sprinkle 1 teaspoon of the dried seasonings on top of the peppers and onions. Place the chicken into a gallon-size ziplock bag. Add the steak seasoning and toss to coat. Now add the remaining dry seasoning to the bag and toss again ensuring all the chicken gets coated. Lay the chicken pieces over the peppers and onions in the slow cooker. Pour the chicken broth around the edges of the crockpot. Once chicken reaches desired doneness, remove to a carving board. Using 2 forks, shred the chicken, tent with aluminum foil and set aside. Using a slotted spoon, remove the peppers/onions from the slow cooker and then pour the liquid out of the slow cooker into a cup or liquid measure. 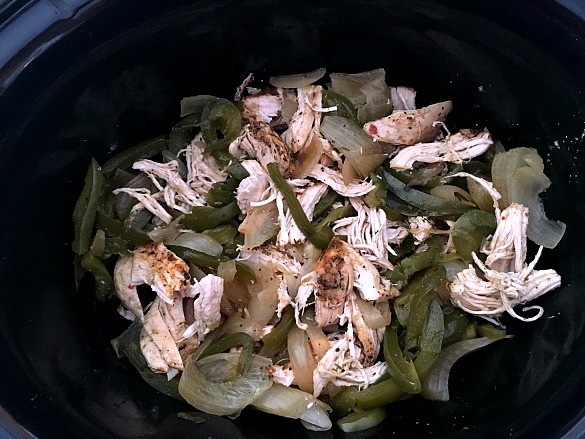 Return the peppers, onions, and shredded chicken to the slow cooker and add enough of the liquid back in to keep the chicken moist, about 1/4 cup to start and add more as needed. Keep the slow cooker on warm or low until ready to serve. Toast the buns under the oven broiler. 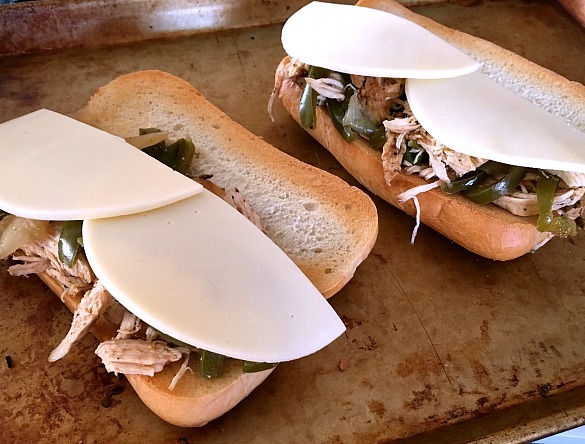 Add some of the chicken and pepper mixture on each bottom half of the bun and top with Provolone cheese. Broil until the cheese is melted and slightly bubbly. Spread mayo, mustard, or 1000 Island Dressing on sandwiches before closing tops and serving. Recipe adapted from Mel’s Kitchen Cafe. For more excellent Slow Cooker Recipes, be sure to check our Allfreeslowcookerrecipes.com. I love slow cooker recipes! These turned out amazing!